Phuket Dolphin Show its an hour dolphin and seals show will make You forget about everything, just make You enjoy awesome sea mammals acting. Great music, fantastic and funny tricks create an atmosphere of childhood full of happiness. Besides, it is scientifically proved, that dolphins energy and ultra sound level can heal a human and You will feel it from the enter! 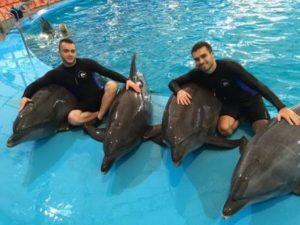 There are 5 gorgeous dolphins and 2 cutest ever seals, which can perform their best first of all for their own fun and then for Your amazement. 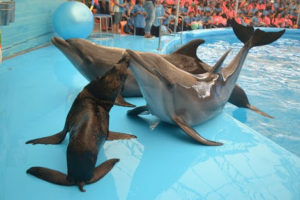 If You take the first row seats, You will be definitely kissed by a seal and have a chance to watch dolphins closely, but for the picture together with them, You need to wait until the end of the show and pay some extra. 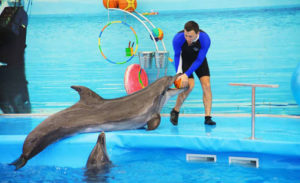 One of the great features of this show is that is was organized by Russian professional dolphin centre and all the cute actors were trained in Russia. Thats why the show boasts for the highest standards and cleanliness among same kind of entertainments in Thailand. You are also welcome to use Your cameras during the show as much as possible, just need to keep some simple regulations regarding the safety for the dolphins. 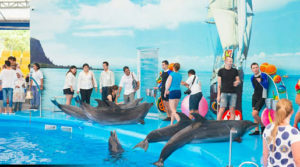 The facilities of the show are brand new as the Phuket Dolphin show was opened in October 2015. But please understand, that its not the place for eating out as it can harm animals, so if You want some refreshments, they are available outside with delicious home made ice cream. The Phuket Dolphin Show operates every day except Mondays at 10:30, 14:0, 17:00. So, You are welcome to choose any time You want. Please note, that the price doest include the transfer, but its available for just 300 THB per person additionally.On Your desire, You can have a chance to swim together with the dolphins for extra 5,000 THB. For booking this availability, please inform about it in Your order. 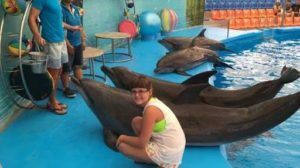 *A good advise will be to combine The Phuket Dolphin Show visit with Phuket Zoo, The Phuket Birds Park and Botanic Garden as they are located in same area. This perfect choice will make Your kids to memorize this Phuket vocation day as the most exciting and touching!